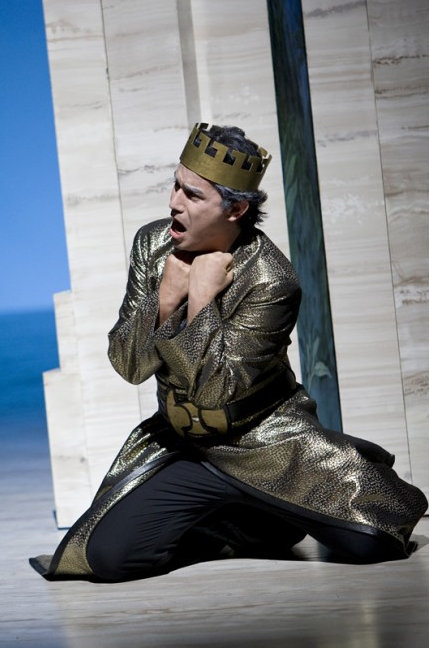 He has sung with Gheorghiu, Domingo and DiDonato; he has starred in the Met, La Scala and the Royal Opera House; he is one of the most desired light-lyric tenors at the moment… and I still hadn’t heard Saimir Pirgu live! Thus, I didn’t hesitate when I saw the chance to attend his Rosenblatt Recital at the Wigmore Hall tonight. He delighted with his great technique, that has led him to conquer the most important stages worldwide. The brass of his voice fills the room without excess, his powerful high notes keep the warm splendid colour of his centre, and the exact amount of vibrato helps his voice flow in the air keeping its presence. Reaching his mid-30s, he already has the perfect voice for lyric roles. It is true though that his attack from the bottom can lead him to push sometimes a little or even go sharp over the pitch. It’s something that we possibly wouldn’t notice when the voice blended into the sound of a whole orchestra, but in the bareness of a piano recital, that becomes evident. His coloratura is also fresh and precise: not only can he sing extremely complicated passages, furthermore he manages to keep the uniformity of his voice. That is really impressive. A pity again that he didn’t present us with his Ferrando, because I have the feeling that it’s the Mozart that would suit him best. He progressed then after the interval to romantic arias by Verdi, Gounod, Cilea and Massenet, a répertoire for which he has a real gift. His voice got a little rounder, wider, improving the quality of his high notes with each new piece. His style isn’t perfect yet, but I’m sure that with that instrument he’ll find it easy to develop the exact amount of legato needed for the lyric roles -we wouldn’t mind either if he improved his French. As an ambassador for his country, he included a couple of Albanian songs in which he really enjoyed. This allowed his expression to peak and his voice to shine even brighter. His rendition of the folk song “Dua me shume shqiperine” got the biggest ovation of the night. Simon Lepper at the piano provided the perfect accompaniment, attentive to Pirgu and with the correct style for each piece. I missed though a little of prominence on his parts. He was too shy even when he was playing the Beethoven Sonata with the guest violinist, and it’s something I don’t agree with: the accompaniment is also a very important part of the music, of the show, it needs to be just as delightful as the lead part, even if it’s not a lied recital. Please accompanists, take note, we want you to let us enjoy more your playing! How lucky are we in London to have the chance to enjoy so many great voices this often? It won’t be easy to forget the warm round bright brass of Saimir Pirgu’s: the silver horn will echo for a long while.